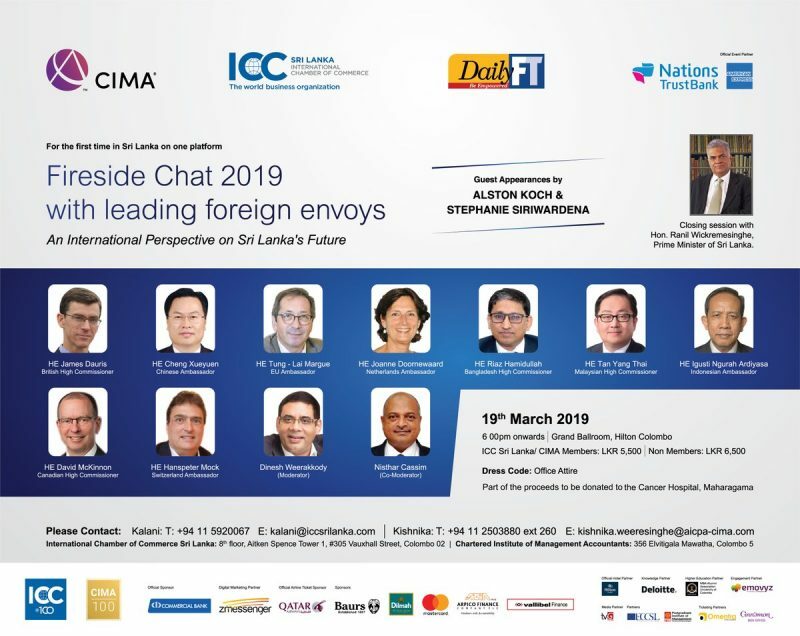 March 20, 2019 (LBO) – Building on the controversy and success of the Fireside Chat 2018 event organised by the Daily FT and the International Chamber of Commerce (ICC), Fireside Chat 2019 was launched with much fanfare and anticipation. The 2018 event generated much controversy with backlash against Sri Lanka’s most prominent businessmen who some have now labeled Sri Lanka’s oligarchs. The 2019 event featured several top diplomats from leading countries like the United Kingdom, Indonesia, China, Bangladesh, Netherlands, Switzerland, Turkey, Canada, Malaysia and the European Union. The event was moderated by HNB Chairman Dinesh Weerakkody and DailyFT Editor in Chief Nishtar Cassim. Also included in the program, which proved to be the main event, was a speech and then question and answer session that featured Prime Minister Ranil Wickremesinghe and business magnate Dhammika Perera. The Hilton’s main ballroom was packed with dignitaries. Among Sri Lanka’s top political figures like Ravi Karunanayake, Harsha De Silva, John Amaratunga among with others in attendance. Also present were the Governor of the Central Bank, the SEC Chairman, the BOC Chairman, and Chairpersons and CEOs of Sri Lanka’s most prominent companies. Sri Lanka’s richest and most prominent businessmen were prominently seated, with Prime Minister Ranil Wickremesinghe seemingly uncomfortably sandwiched in between Dhammika Perera and Harry Jayawardena during much of the proceedings. The PM’s remarks focused the fact that although painful, the government has got Sri Lanka’s fiscal and monetary house in order. He suggested that now that the house was in order, and perched on a strong foundation, that measures to grow Sri Lanka’s sputtering economy will be more effective and sustainable. The PM said that the government has expedited paying all of its outstanding bills, with only Rs30bn of outstanding bills left to settle from 2018. He said that the government is also moving to settle the remaining Rs30bn as soon as possible to get cash into the economy. The government is now moving to actively stimulate the economy, with Rs300bn of measures being enacted. His remarks also indicated that Sri Lanka’s interest rates will start to come down, as inflation is under control and Sri Lanka’s fiscal house is finally in order. He also publicly stated that they were moving slowly but surely in an effort for Sri Lanka’s largest pension fund, the EPF, to increase investments in the country’s floundering stock market. During the question and answer session, business magnate Dhammika Perera was citing statistics criticising Sri Lanka’s lack of economic and per capita income growth during the last several years. He put forward several policy measures which have been mentioned before and make sense, but still have not been implemented. He was critical of over taxation and the lack of job creation in the economy. Perera’s remarks were pro growth, while the PM’s remarks featured growth after fiscal consolidation. Perera indicated at one point that if the economy were growing strongly that fiscal consolidation would become irrelevant. Perera has had stints in the public service when he was Chairman of the BOI and Secretary to the Minister of Transport under the previous government. His accomplishments in previous public service stints have not provided any evidence that he would be able to deliver past the idea stage to implementation. There has long been speculation that the business magnate harbours Trumpian presidential ambitions, and he took to the stage in a sharp contrast to Sri Lanka’s most important political figure Ranil Wickremesinghe. After responding to the criticisms of Dhammika Perera, the PM couldn’t resist having the final word and ended his part of the session with the final remarks. His remarks roasting Dhammika Perera were a subtle but humorous reminder that Dhammika Perera is a businessman, which is very different from a political leader. With that the PM departed. Dhammika Perera was perhaps treated to the fickle nature of Sri Lanka’s electorate in the next series of events. The next session was with him, the India head of global accounting and consulting firm Deloitte, and the event’s esteemed moderators. As the PM made his way out of the ballroom, the capacity crowd quickly followed, leaving a much smaller audience to listen the the remainder of Perera’s remarks. It would seem keeping the attention of a Sri Lankan audience is not as easy as it looks.